In the following ways we try with your assistance to get a general idea of where the real source of your problems lies and to decide how in the long-term this source can be eliminated. 1. Visible features: Dies beginnt schon in dem Moment in dem wir Sie das erste Mal sehen. Insbesondere Ihre Körperhaltung und Ihr Gang verrät uns schon viel über Ihre Krankeitsgeschichte. 2. Medical history: At this stage we need to be sure that you have given us as accurate as possible a description of the development of your ailment on our Medical History from. There may be lots of things on it don’t appear at first to have anything to do with your present problems, like for example your job, sports you do or did, or past accidents or operations. It is imperative that you inform us if you are taking cortisone or have taken it – even if it was a year ago. To complete our diagnosis we need to know the dose and how it is or was administered. You can now download the medical history form here, then print it out and fill it in before you visit us. 3. Manual Movement Cybernetics: By using gentle movements we can check to see if there are any blockages in any part of your muscoloskeletal system. These can usually be cleared again quickly with the use of very stimuli. This usually lasts less than five minutes. 4. Foot reflexology: Reflexes are checked and the results are taken into account in the subsequent diagnosis. 5. Physical examination: Depending on the initial findings your lungs will be listened to with a stethoscope and further classical tests will be carried out. 6. Thermography: Should there be any uncertainty we can also do a thermographic test, which records the minutest differences in the temperature on the surface of your limbs. In this way inflammation and degeneration and also changes brought about by our treatment can be indicated and further procedures can be initiated if required. Fundamental for the lastingly successful elimination of the majority of problems is the participation of the patient, who actively takes responsibility for him- or herself. Our philosophy is, “We do in the surgery what you cannot do at home”. After you have filled in your medical history form, you will be shown into a treatment room. We will look at any X-rays or diagnoses you have brought with you. After this, if you show signs of a shortening of the abdominal muscles (this can normally be diagnosed from your stature), you will be placed on the ‘Belly Turtle’, which will gently stretch your abdominal muscles. After this all your major limbs will be examined and if necessary manual movement cybernetics will be used to remove any blockages. Your body will be checked through your foot reflexes and will be treated if necessary; Or A thermograph will be used for further diagnosis. A period of rest in the prone position follows treatment, because the body has to adapt to the new adjustment of the limbs. During the rest period you will often be exposed to a coloured light therapy, especially in winter. Your back (or other treated part of your body) will then be examined again and blockages will be released by using ‘chiroenergy’. Finally your self-treatment at home will be discussed with you. During all follow-up appointments your limbs will be checked again and blockages will be released if necessary. Depending on your progress, in addition to reflexology on your feet, we may prescribe and introduce ultra-sound, the use of taping or colour vacuum therapy sessions, hot roll massages or ear-candle therapy. Even if it only means giving up five minutes twice a day to do your self-treatment, it is because of its constant repetition an essential part of your own road to recovery. Follow the instruction we give you and do not over-do it. A lot does not always help a lot – rather the opposite. Using the ‘belly turtle’ to gently stretch your hip flexors and your abdominal muscles (almost 90% of patients have shortened abdominal muscles, which can lead to problems with shoulders, neck, back, knees and feet. Please note: If you for whatever reason do not want to adopt the home training recommended by us, this can in our experience lead to an increase in the treatments in our surgery. At the same time the danger increases, that any progress achieved by our treatment will be nullified and that your problems will reemerge because you will return to your former habits and relieving posture. We recommend even after a successful treatment and according to how much wear and tear your body is exposed to, that you visit us every three to six months for a check-up: your body is a mechanical unit, which needs to be cared for and serviced. Strictly speaking Chiroenergetik® is a special way of resetting which avoids pulling and wrenching and reaching a probable precision of 100%. Muscles and connective tissue layers (fascia) are positively modified using minimal energetic stimuli. Almost all blockages are simultaneously eliminated. This technique has no side-effects, so that even professional sportsmen and –women normally do not need to take time off. It doesn’t matter if the blockages are in the muscles or in the bones. 2. Bad posture e.g. imbalance within the muscular framework. Blockages caused by traumas can usually be removed using Chiroenergetik® and they will as a rule disappear. Blockages caused by bad posture require patient participation, because muscle memory often causes these to reappear. Chiroenergetik® can also be used to reset dislocations promptly, so that the healing process for injuries is significantly improved. Chiroenergetik® is combined in practice with elements of almost all schools of medicine and is therefore probably the most successful holistic therapeutic concept in the treatment of the musculoskeletal system. 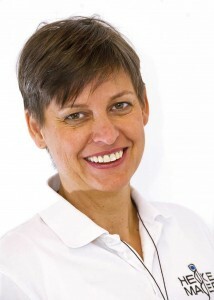 On the basis of Chiroenergetik® Heike and Carina Mayer have developed a holistic therapeutic concept which involves the patient in a suitable way especially by combining treatment with products like the Belly Turtle and the practical guide Fit for the Day. This therapeutic concept is based on the premise that the human body is basically a mechanical unit made up of a lot of different parts. As with any machine it is imperative that all the separate parts are combined in the best possible way and that they interact at an optimal level. Thanks to Chiroenergetik® this optimisation is usually highly successful. Reflexology for the feet is used successfully in many therapeutic fields. Patients request and accept this treatment with increasing interest. Research studies prove it is effective. Even more convincing than all these studies is our own experience and the similarity in shape between a upright foot and a seated person proves that there is a connection. This means that all our corporal systems can be transposed to our feet and can be treated from here. The effect of this therapy extends beyond the physical body and encompasses the person as a whole, even on an emotional level. Foot reflexology is constantly being developed. In the last few years zones have been defined more precisely and forms of treatment have been improved and refined. The therapy can in this way be adapted to the increasing complexity of symptoms. It can be applied on an individual basis to patients today with their complex ailments and can achieve good results. Many people find the foot treatment extremely beneficial, especially in our intellectually challenging world. Reflexology can be administered on its own, in combination with other treatments and in addition to orthodox medicine. The Medical Taping Concept has become an essential addition in our surgery. Ear candles are used to gently relax the muscles, especially in the jaws. A manual treatment to relax the muscles. Recently we have started to use a thermal imaging camera to help us in our diagnosis. The pictures show the condition before and after treatment. Note the increased circulation in the calves and the Achilles tendon (bright colour = more heat). You can download your Medical History Form here.